Iceman is a fictional character, a superhero who appears in comic books published by Marvel Comics. He is a founding member of the X-Men. A mutant, Iceman has the ability of cryokinesis where he can freeze anything around him and can also turn his body into ice. Although he is an Omega-level mutant, Drake has yet to tap into his full mutant potential. He has, however, begun to take more interest over the years in developing his abilities. One of the original X-Men, Iceman has had a frequent presence in X-Men (and Spider-Man)-related comics, video games, animated series, and movies. Shawn Ashmore portrays Iceman in the X-Men films, and voices the character in The Super Hero Squad Show. 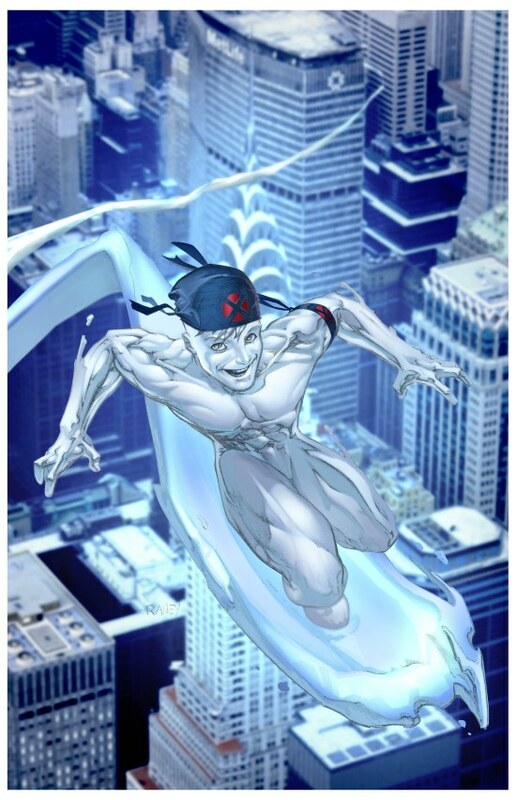 Iceman possesses the power to instantly decrease the temperature of ambient water vapor in his immediate environment to below zero degrees celsius, thereby freezing it into ice. He is able to make unbreakable ice that will not break unless he wills it to. In this manner he is able to quickly form a great variety of ice structures, including projectiles, shields, ladders, baseball bats, etc. He often makes ice slides which form rapidly beneath and behind his feet, moving him along the slick surface at high speeds. He is also able to form exceedingly complicated structures within relative short time like, for example, miniature cities. Originally, Iceman's own body temperature would lower dramatically when his powers were active, reaching −105 °F (−76 °C) within a few tenths of a second (now his body usually converts to organic ice; see below). 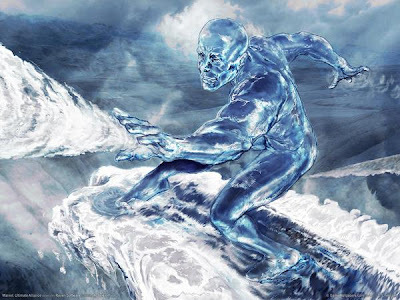 Iceman is immune to sub-zero temperatures; he is also able to perceive the thermal energy level of objects around him. Because cold is the absence of heat, Iceman does not actually 'emanate' cold; rather, he decreases thermal energy. As mentioned by writer Mike Carey, Iceman is "an Omega level mutant...[and] has powers that can influence the ecosystem of the entire world." In his early appearances, Iceman generally covered his body in a thick layer of what appeared to be snow; hence he looked more like a traditional snowman than an ice-man. Upon further training in the use of his powers, he was able to fashion an armor of solid ice around his body when using his powers, which afforded him some degree of protection against concussive force and projectiles. Later on, he manifested the ability to convert the tissue of his body into organic ice. He sometimes augments his organic ice form with razor sharp adornments to his shoulders, elbows, knees, and fists. Iceman has also been able to move rapidly to another distant location while in his organic ice form, being able to deposit his bodily mass into a river and reconstitute his entire mass a great distance away in a matter of minutes (by temporarily merging his molecules with those of the river). On one occasion, Iceman suffered a severe chest injury while in his ice form and was able to heal himself by converting back into his normal human form. Iceman is also able to reconstitute his organic ice form if any part of it is damaged, or even if it is completely shattered, without permanently harming himself. He can temporarily add the mass of a body of water to his own, increasing his mass, size, and strength. He can survive not only as ice, but as liquid water and water vapor. He can also transform his body from a gaseous state back to a solid, although it is physically and mentally taxing. 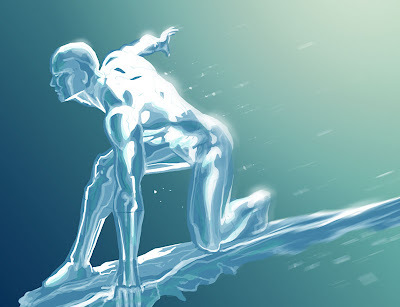 Iceman can also freeze sea water, as seen during the "Operation Zero Tolerance" story arc. While he usually does not use his powers in lethal ways his powers are so vast that it extends to the molecular level, to the point that he can freeze all of the molecules of an object/being with a thought; he once froze every single molecule of water within the body of David Haller. Iceman is also able to dissolve his own icy constructs. Iceman's powers were pushed to their limit while possessed by Emma Frost, who used Iceman to discover the fate of her Hellions. During this time Iceman was able to control all forms of moisture, freeze fluids inside people's bodies, travel as a liquid, solid or gas. Not even the combined might of the X-Men Gold team was able to stop Emma Frost in Iceman's body. Following this, Bobby confronted Emma about how she was able to use his powers so effectively. While together they made some initial progress, she refused to train him further. Instead he turned to Storm because they share similar elemental powers and she agreed to tutor him. When Iceman was injected with Sinister's neuro-inhibiter by Mystique, he was able to save himself by drawing in all of the ambient moisture around him, rapidly replacing his poisoned cells with healthy material before the injection could kill him. Aside from his superhuman powers, Iceman is also a fair hand-to-hand combatant, and received combat training at Xavier's School as well as coaching from the Black Widow and Hercules while serving with the Champions of Los Angeles. Iceman has as much combat training as Cyclops or Beast.